A family-run business which specialises in manufacturing bespoke wooden furniture for the corporate and consumer markets has launched in Rotherham after receiving a £500 grant from the UK Steel Enterprise (UKSE) Kickstart Fund. 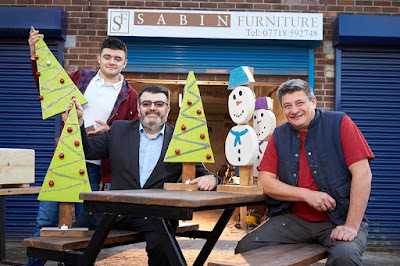 Established in September 2018 by Lee Sabin and his son James, a skilled carpenter, Sabin's Furniture is the newest addition to Bolton Road Business Park in Wath. Lee Sabin, owner of Sabin's Furniture (pictured, right), said: "Earlier this year James and I decided to combine our skillset – with him overseeing production, and me managing the business side of things – in order to pursue our dreams of working for ourselves and producing beautiful, bespoke furniture for our customers. Alan Stanley of UKSE (pictured, centre) added: "Both Lee and James are clearly very passionate about making this work and I have no doubt that their hardworking mentality and production of quality products will stand them in good stead for success – best of luck to them both."